Many exotic healing foods from around the world have made it onto the shelves of North American supermarkets, but that doesn’t mean that some of the old standbys aren’t just as valuable. While you can now buy nutritious alternatives, like guava juice, lychee juice, and coconut water, orange juice is still an excellent option for boosting your nutrient intake. In a recent study, researchers from Louisiana State University examined the nutritional value of orange juice. They recruited 7,250 children between the ages of two and 18 as part of the National Health and Nutrition Examination. From this large trial, the researchers were able to extract data about orange juice consumption and its relation to nutrition. The researchers found that there were no significant differences in weight or body mass index (BMI) between those who drank orange juice and those who didn’t. However, those who drank orange juice regularly had higher levels of vitamin A, vitamin C, folate, and magnesium. 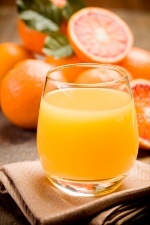 Consumers of orange juice also had higher intakes of total fruit, fruit juice, and whole fruit. The researchers concluded that moderate consumption of 100% orange juice should be encouraged as part of a healthy diet. Of course, while the study focused on children, orange juice is nutritious for people of any age. O’Neil, C.E., et al., “One hundred percent orange juice consumption is associated with better diet quality, improved nutrient adequacy, and no increased risk for overweight/obesity in children,” Nutr Res September 2011; 31(9): 673–82.